(Newser) – The makers of Star Wars have put a quick end to rumors that while Carrie Fisher has died, her Princess Leia may live on. Making a rare foray into the sprawling world of Star Wars speculation, Lucasfilm said Friday night that there are no plans to digitally recreate Fisher to appear in future episodes of the movie saga. "There is a rumor circulating that we would like to address," a company statement said. "We want to assure our fans that Lucasfilm has no plans to digitally recreate Carrie Fisher's performance as Princess or General Leia Organa." 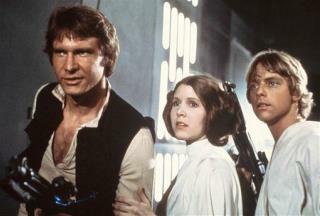 Fisher, who reprised her role as Leia in 2015's Star Wars: Episode VII—The Force Awakens, had finished shooting Star Wars: Episode VIII, due out next December, when she died Dec. 27 of cardiac arrest at age 60.
carrie fisher's princess leia is sure to pop up as a hologram or force ghost in a future film! As Always Carrie(Princess or General Leia) your FORCE will be with us 4ever in that GALAXY FAR,FAR,AWAY! You & your Mother(Debbie) RIP! There ya go ALL! I think once they figure out people would pay to see Fisher digitally recreated we will hear and entirely different spin on the subject.